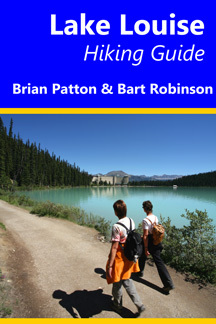 The Lake Louise Hiking Guide by Brian Patton and Bart Robinson is a full-colour eBook from the authors of the Canadian Rockies Trail Guide, which with sales of over 270,000 copies is one of best-selling non-fiction books in Canadian publishing history. There are few hiking areas in the world that can rival the Lake Louise region for the accessibility of stunning mountain scenery. Within the Lake Louise and Moraine Lake region are 18 designated hikes and a variety of options to extend your wilderness experience—over 160 kilometres (100 miles) of trail traversing some of the most rugged alpine scenery on the continent. Lake Louise is the birthplace of recreational hiking in the Canadian Rockies. Soon after the erection of the first rustic chalet on the lake’s shoreline in 1890, manager Willoughby Astley began clearing trails to scenic points above the lake. In 1893, a pair of young adventurers from the eastern U.S., Walter Wilcox and Samuel Allen, began a systematic exploration of the region. The following summer, they discovered and explored Paradise Valley, Sentinel Pass and the upper end of the Valley of the Ten Peaks, and completed the first ascent of Mount Temple. In 1899, Wilcox and a companion made the first recorded visit to Moraine Lake and nearby Consolation Valley. Wilcox and Allen named many local features, and their explorations led to further trail construction by the Canadian Pacific Railway. As these trails became popular, the CPR built teahouses and shelters at strategic locations. In fact, hotel staff maintained much of the local trail system through the mid-20th century. Click on Download eBook to purchase through Paypal and we’ll send you a PDF file that can be loaded on your PC or tablet. This file has been formatted for optimum printing options, so you can print out the entire book or just a selection of trails. Purchase through Amazon and the Lake Louise Hiking Guide will be uploaded to your Kindle Cloud Reader. Even if you don’t have a Kindle device, the free Kindle app allows you to access the eBook on your phone, tablet, or PC and MAC. The book is available at Amazon stores worldwide, with links to the most popular on the left side of this page.